A phone call in the middle of the night…the usual beginning to a crisis. Human factors are stacked against you: you are half-awake and have a hard understanding the information streaming over the phone, the person on the other end of the line is stressed and speaking quickly, and the whole time the crisis is evolving and changing. It’s playing catch-up with lives on the line. This is perhaps an organization’s worst fear; having employees in danger miles away, across multiple time zones, with little to no connectivity. It can happen to a company of any size. While there are tools and resources that make crisis resolution easier, any organization can build a crisis management team to better protect their employees and provide the requisite duty of care. One person cannot handle a crisis. A team is required with each member adept at a certain skill set or business function in order to effectively address all the aspects of the challenge. Team Leader. He or she is responsible for supervising the crisis management team, delegating tasks, and authorizing the messaging campaign. Ideally a C-suite officer with decision-making authority who has a direct line to the CEO. Security / Medical. This team member is responsible for overseeing the security response, the medical evacuation, patient tracking, and the logistics of moving employees out of a high-risk area. The security/medical officer is the primary interface for any contracted security or medical providers and is ideally someone with military or crisis management experience. Human Resources. The HR representative is responsible for verifying employee information, insurance protections, and next of kin notification information. Financial. 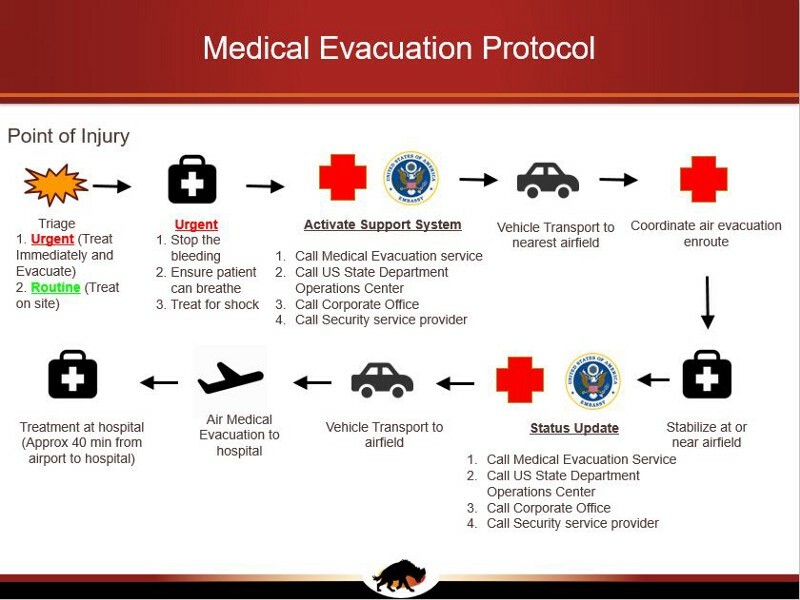 Money will have to be moved around during a crisis situation, whether to support a security response team, an emergency evacuation flight, or medical treatment for an employee whose insurance is not accepted at an overseas hospital. The financial officer needs to have the ability to authorize fund allocations in a timely manner and have a direct line to the CFO. Strategic Communications. With today’s global media, the news will get out quickly. It is imperative for the organization to lead the narrative race, especially when it comes to notifying next of kin prior to them finding out from social media. It is one of the team leader’s critical responsibilities to quickly authorize the messaging campaign developed by the communications representative. Scribe. Whether this duty is assigned to a single person or as a collateral duty, all of the crisis management team actions must be logged and time stamped. This log will be vital for any type of legal review or after action report. What do I know? Who needs to know it? Have I told them? This simple phrase is a guiding principle for managing crisis operations. To streamline information, a flowchart is needed for the most common situations. These flowcharts are then compiled into a crisis management playbook providing a straightforward reference manual that is easy to read and comprehend in a high-stress situation. The final step is training. Crisis management team training can be done quite easily with no additional resources. Given an hour of time, a script, and any form of communication (Skype, email, Slack, WhatsApp, phone, voice), the team can work through evolving crisis scenario. The simple act of communicating effectively, finding the right information quickly, and crafting the needed messages will truly test the team. Several security/medical service providers often allow for test calls to be made to their assistance centers. This facet should be integrated into team training whenever possible. It is imperative to follow each rehearsal with a thorough after action review capturing the lessons learned in a report. A regular rehearsal schedule is critical to ensure the team has the adequate practice and muscle memory to handle a real-world crisis. In closing, build the crisis management team in your organization before you need it. The welfare of your employees depends on it. Training is essential to ensure that everyone knows what to do when an emergency hits. Members of the crisis management team should be trained so they are familiar with their responsibilities within the emergency, communications and business continuity plans. All employees must become familiar with protective actions for life safety, as well as building and information security.